Fighting Scot becomes the fourth active Fighting Scot to have reached 1,000 career points in win over Mercyhurst University on Jan 30. Psychology major Victoria Manzano expresses herself through her illustration in this week's Art Spotlight. Coverage of the Student Government Association's meeting on Jan. 28. 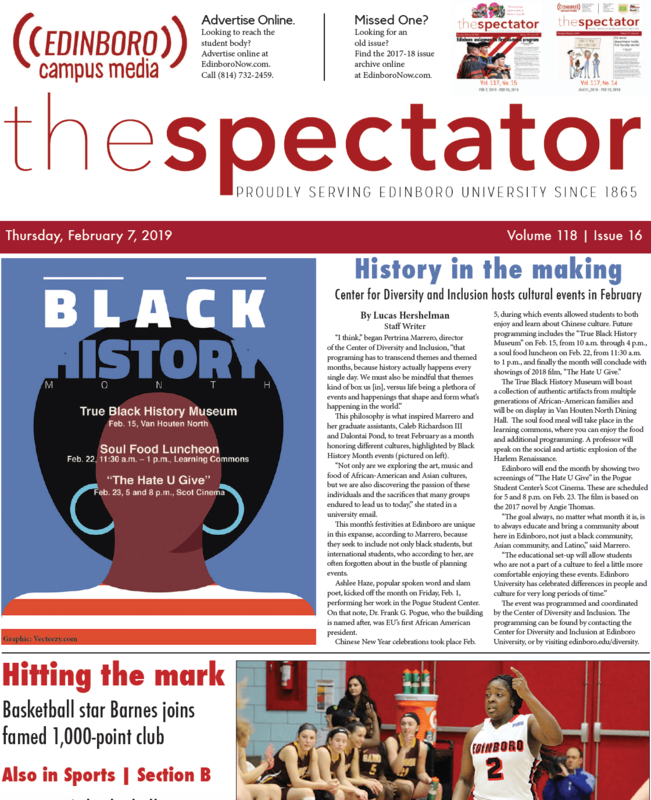 Univeristy news in this week's issue of the Spectator. Head Coach Callie Wheeler’s 14th win ties Stan Swank’s debut season mark with 8 games left in the team's regular season. Staff writer Anisa Venner-Johnston and arts editor Nathan Brennan discuss the Mueller investigation in this week's Overheard Debates. Staff writer Beau Bruneau disscusses his personal take on amusement parks and disabilities.